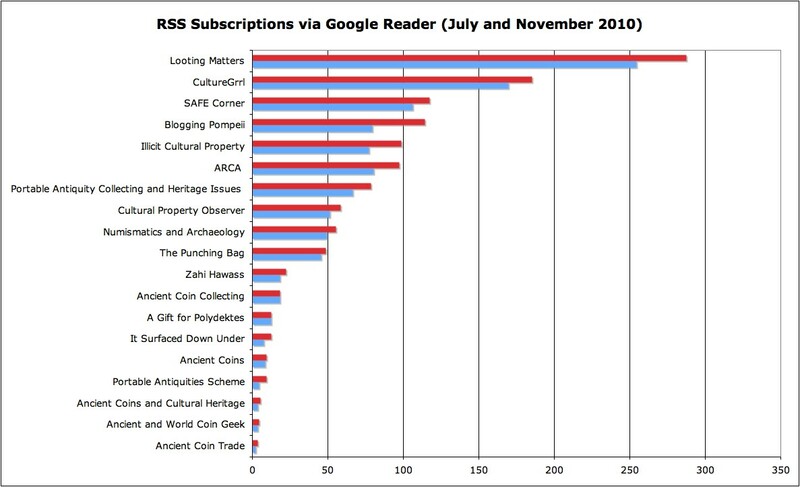 Back in July 2010 I took a snapshot of those subscribing to Looting Matters via RSS and Google Reader. I have just taken another look and note that 287 people receive LM in this way. (RSS is also delivering to other Web 2.0 contexts so this is a partial figure.) This means that in October approximately 8000 posts were delivered to electronic desktops, smart phones, iPads and other mobile devices. This was in addition to the 13,695 visits to the website over the same period; email subscriptions are on top of that figure. For convenience I have combined the latest figures (red) with those for July (blue) to give some idea of how subscriptions have changed. I always start my day by looking first at Looting Matters.